In both the public and private sectors the impact of initiatives such as the Housing our Ageing Population: Panel for Innovation1 and Housing our Ageing Population: Plan for Implementation2 reports are challenging providers to raise their game and offer better quality independent living for old age. 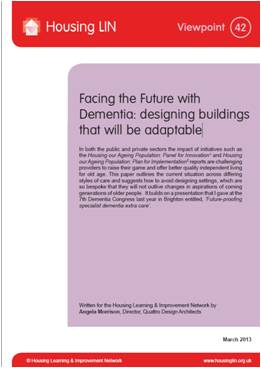 This paper outlines the current situation across differing styles of care and suggests how to avoid designing settings, which are so bespoke that they will not outlive changes in aspirations of coming generations of older people. It builds on a presentation given at the 7th Dementia Congress last year in Brighton entitled, ‘Future-proofing specialist dementia extra care’.